Now, when I saw an offer for a £5 subscription box, I simply HAD to try it! 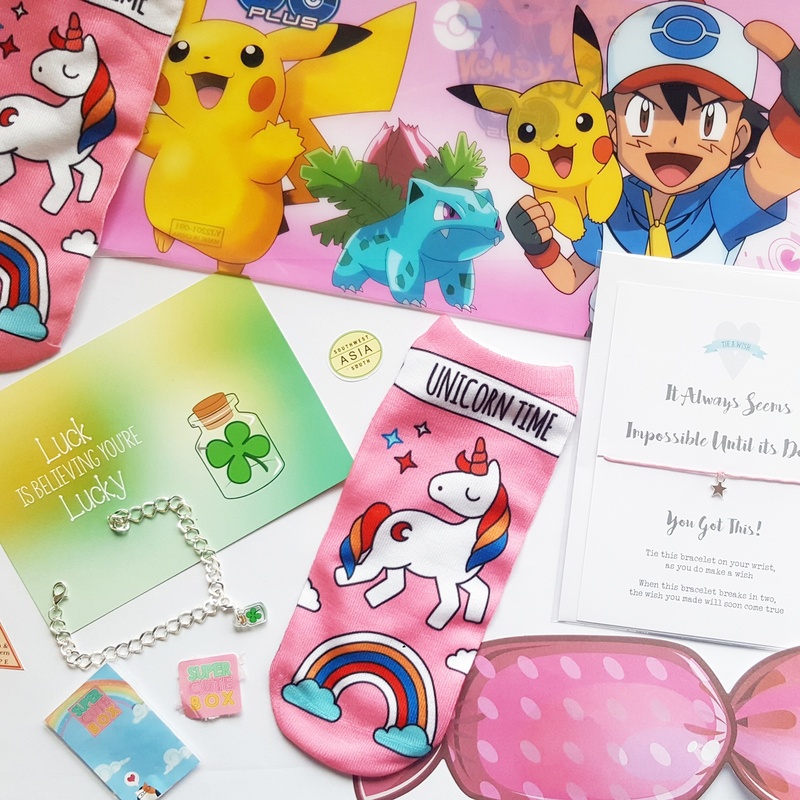 Provided you don’t mind a little kawaii, anime or I suppose kitsch items, then this box is for you! It’s full of cute, novelty and useful items from around the world. This month’s box included a pair of unicorn socks. Although a little small, they were indeed, super cute! I wore them immediately. Secondly, I loved the wish bracelet from ‘Tie a Wish’. For £2.99, you are able to purchase a lovely keep sake, ideal for parties, weddings or thankyou tokens. They simply tie into your wrist or my preference of ankle. There’s a variety of charms and messages to choose from. Luckily I’m a Pokémon fan, I’m also a stationary fan and BIG on organisation. So a Pokémon Go themed folder will always go down well. I was disappointed by the sweet themed paper, they felt a little pointless and the kitty postcard just wasn’t for me (despite being a popular request!). But I did use the Hello Kitty pen and the Cath Kidston magnetic shopping list looks great in my country themed kitchen! Each box contains a month charm (first box includes the bracelet). 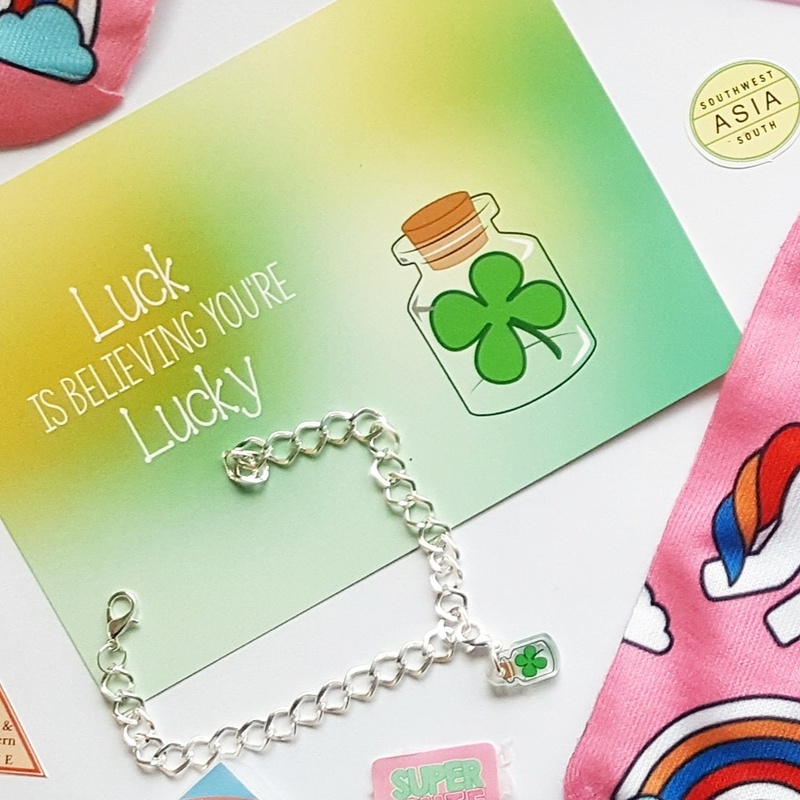 This month the theme was luck! So naturally a four leaf clover. I like the collectable nature of this box, making you want to fill the bracelet! I definately got my value for money, but regular boxes cost £16.00 for a subscription (free UK delivery) or a one off box for £18.00. they also do international delivery. Sadly I this box is just out of my usual price range, but I’ll definately be following their future promotions.